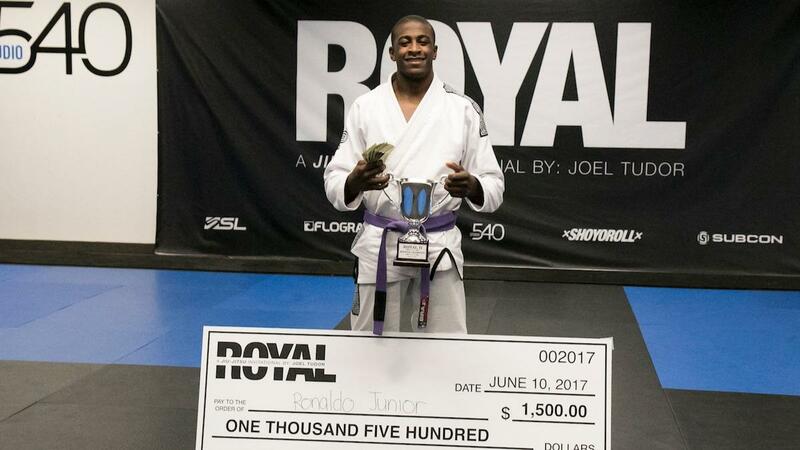 The winner of the middleweight bracket at the Royal II Invitational in Solana Beach, CA, on June 10 was a relatively unknown purple belt, but Ronaldo Junior has been a presence on the competition scene since he was a child. While Junior, 20, has collected medals during his two-year run at purple belt, it was the Royal Invitational at Studio 540 the weekend after Worlds that provided a stage for him to really shine. Junior began training at Projeta JJ at 10 years old. Once he earned his yellow belt a year later, he moved to the Pitbull Club under Adilson "Bitta" in Teresopolis, a city two hours outside of Rio de Janiero. This is the same team that brought up old school black belt world champion Delson Heleno and GF Team's powerhouse athlete Vitor Oliveira. The need to move to a more international team - like some athletes do on their path to black belt or in search of world titles - never crossed Junior's mind. "Pitbull is a small gym but has a good quality of training, and in my opinion my evolution depends more on me than on the help of training partners," he said. It is with this mentality and the support of his family since day one that has helped him continue to move forward in the sport for the last 10 years. It wasn't always successful, though. Junior's first trip to the U.S. was for the 2015 Worlds as a blue belt, where he lost his first match. The following year at Pans, he decided to stay in the States. Marco Nascimento of Peninsula BJJ in Foster City, CA, is a black belt under Bitta and was able to host Junior in his academy. Having spent the last year gathering gold medals at the Long Beach Open, San Jose Open, Las Vegas Open, and San Diego Open, he also competed at NAGAs, BJJ Tour tournaments, in both gi and no-gi divisions, also fighting in the absolute divisions. This hard work and consistency resulted in a silver medal in his weight division at the IBJJF 2017 Pans. He takes all challenges that come his way and also believes in simply focusing on his hard work and dedication. In this way, opportunities will arise and any help he receives will be deserved. The only time he was ever deterred from his path was his first loss as a blue belt in 2012. “When I lost my first championship, I felt very sad it was the only time I thought about stopping jiu-jitsu, but the next day I went back to the gym to train more”. The challenges on the mat were not the only obstacles Junior faced - a lack of resources also affected his training. "I felt humiliated for not having the ability to train every day," he said. "Sometimes I would only go to no-gi training - not because I liked it, but because I did not have a gi to train jiu-jitsu. I often went to train with ripped kimonos, no supplements… I would only go for the love and dedication." At the Royal Invitational, Junior was in a bracket with blue, purple, and brown belt stars. With four fights and two submissions - an armbar and an ankle lock - he earned the $1,500 paycheck and winner's trophy, firmly placing his name among jiu-jitsu's rising talents. In the final, he faced Guthierry Barbosa of Caio Terra, a familiar adversary considering they have fought against each other eight times in both gi and no-gi back in Brazil. Junior was able to earn another win, this time in the most important setting yet. For now, you can find Junior on the mats at Peninsula BJJ teaching the young generation of practitioners. His goal is to grow as an athlete and person and conquer what no one has yet achieved.